Limited Warranty: Subject to the terms and conditions set forth herein, ENDY AUSTRALIA ("ENDY") provides this Limited warranty for its product only to the person or entity that originally purchased the product from: ENDY or its authorized reseller and, products purchased and delivered within Australia. ENDY warrants its products to be free from defects in workmanship and materials, under normal use and service, for the period set forth below applicable to the corresponding product brand from the date of purchase from ENDY or its Authorised Resellers in Australia. The "Warranty Period" is effective only on the date of invoice purchase of the product from ENDY Australia. The dated ENDY Invoice showing the date of purchase serves as the proof of purchase. You may be required to present the proof of purchase or provide device serial number to avail of the warranty service. 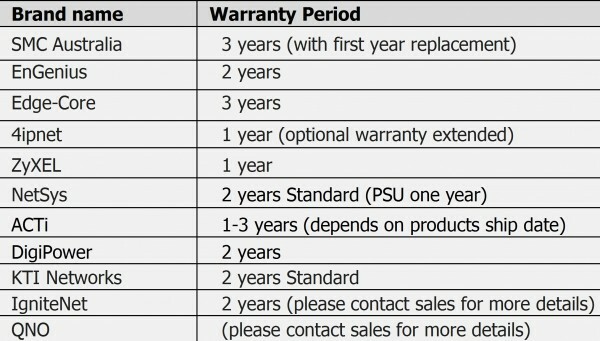 If there is no proof indicating the purchase date, the manufacture date shall be considered as the beginning of the Warranty Period. During the warranty period ENDY will repair or replace the defective products returned to applicable manufactures. ENDY’s sole obligation shall be to repair or replace the defective product during the Warranty Period at no charge to the original owner or to refund at ENDY’s sole discretion. The replacement product need not be new or have an identical make, model or part. ENDY may in its sole discretion replace the defective product (or any part thereof) with any reconditioned product that ENDY reasonably determines is substantially equivalent (or superior) in all material respects to the defective product. Repaired or replacement product will be warranted for the remainder of the original Warranty Period from the date of original retail purchase. If a material defect is incapable of correction, or if ENDY determines in its sole discretion that it is not practical to repair or replace the defective product, the price paid by the original purchaser for the defective product will be refunded by ENDY upon return to ENDY of the defective product. All product (or part thereof) that is replaced by ENDY, or for which the purchase price is refunded, shall become the property of ENDY upon replacement or refund. Customer must prepay shipping and transportation charges, and insure the shipment or accept the risk of loss or damage during such shipment and transportation. ENDY will ship the repaired or replacement products to customer freight prepaid. What Is Not Covered: This limited warranty provided by ENDY does not cover: Products, if in ENDY’s judgment, have been subjected to abuse, accident, alteration, modification, tampering, negligence, misuse, faulty installation, lack of reasonable care, repair or service in any way that is not contemplated in the documentation for the product, or if the model or serial number has been altered, tampered with, defaced or removed; Initial installation, installation and removal of the product for repair, and shipping costs; Operational adjustments covered in the operating manual for the product, and normal maintenance; Damage that occurs in shipment, due to act of God, failures due to power surge, and cosmetic damage; Any hardware, software, firmware or other products or services provided by anyone other than ENDY; Software programs, batteries, cables or other accessories supplied in or with the products; Products that have been purchased from inventory clearance or liquidation sales or other sales in which ENDY, the sellers, or the liquidators expressly disclaim their warranty obligation pertaining to the product. Repair by anyone other than ENDY will void this Warranty. Limitation of Liability: TO THE MAXIMUM EXTENT PERMITTED BY LAW, ENDY IS NOT LIABLE UNDER ANY CONTRACT, NEGLIGENCE, STRICT LIABILITY OR OTHER LEGAL OR EQUITABLE THEORY FOR ANY LOSS OF USE OF THE PRODUCT, INCONVENIENCE OR DAMAGES OF ANY CHARACTER, WHETHER DIRECT, SPECIAL, INCIDENTAL OR CONSEQUENTIAL (INCLUDING, BUT NOT LIMITED TO, DAMAGES FOR LOSS OF GOODWILL, LOSS OF REVENUE OR PROFIT, WORK STOPPAGE, COMPUTER FAILURE OR MALFUNCTION, FAILURE OF OTHER EQUIPMENT OR COMPUTER PROGRAMS TO WHICH ENDY’S PRODUCT IS CONNECTED WITH, LOSS OF INFORMATION OR DATA CONTAINED IN, STORED ON, OR INTEGRATED WITH ANY PRODUCT RETURNED TO ENDY FOR WARRANTY SERVICE) RESULTING FROM THE USE OF THE PRODUCT, RELATING TO WARRANTY SERVICE, OR ARISING OUT OF ANY BREACH OF THIS LIMITED WARRANTY, EVEN IF ENDY HAS BEEN ADVISED OF THE POSSIBILITY OF SUCH DAMAGES. THE SOLE REMEDY FOR A BREACH OF THE FOREGOING LIMITED WARRANTY IS REPAIR, REPLACEMENT OR REFUND OF THE DEFECTIVE OR NON-CONFORMING PRODUCT. THE MAXIMUM LIABILITY OF ENDY UNDER THIS WARRANTY IS LIMITED TO THE PURCHASE PRICE OF THE PRODUCT COVERED BY THE WARRANTY. THE FOREGOING EXPRESS WRITTEN WARRANTIES AND REMEDIES ARE EXCLUSIVE AND ARE IN LIEU OF ANY OTHER WARRANTIES OR REMEDIES, EXPRESS, IMPLIED OR STATUTORY. Governing Law: This Limited Warranty shall be governed by the laws of the State of New South Wales, Australia. Copyright Statement: No part of this publication or documentation accompanying this Product may be reproduced in any form or by any means or used to make any derivative such as translation, transformation, or adaptation without permission from ENDY. Contents are subject to change without prior notice.